SCOTTSDALE, Ariz. Dec. 16, 2015 – Barrett-Jackson, The World’s Greatest Collector Car Auctions®, will auction an impressive group of collectible Porsche sports cars during the company’s nine-day 45th Anniversary from Jan. 23-31, 2016, at WestWorld of Scottsdale. The group of German sports cars crossing the block includes a rare WeissachEdition2015 Porsche 918 Spyder (Lot #1392), a Porsche 911 Speedster (Lot #1368) and a 930 Turbo (Lot #1367), as well as two Porsche 356s (Lot #1385) and (Lot #1386). Highlighting the impressive selection is a 2015 Porsche 918 Spyder Weissach Edition (Lot #1392) being offered for the first time in Barrett-Jackson history.With production capped at 918 units, the fortunate few with one of these e-hybrid Spyders realized their luck, tucked them away and are rarely tempted to let them go. This particular Weissach option reduces the weight of the vehicle through specific measures such as the addition of magnesium wheels, a lighter brake design, ceramic wheel bearings and titanium bolts for the chassis. The driver has access to 887hp, quarter-mile sprints in the nine-second range and a top speed of 210 mph. With only 595 original miles, this vehicle crossing the auction block represents a rare opportunity to own one of the highest-performing supercars in the world. Documented with a Porsche Certificate of Authenticity, the 1989 Porsche 911 Speedster (Lot #1368) is one of only 814 produced for the United States that year. It features Turbo-style bodywork with flared fenders and wider tires. The Speedster also uses many of the Turbo’s suspension components and its heavy-duty four-piston disc brakes with ventilated and cross-drilled rotors. Beneath the famous sloping tail is Porsche’s air-cooled 3.2-liter flat-6 engine mated to a short-throw-shifted 5-speed gearbox and only has 12,627 miles on the odometer. One of the most coveted Porsches at the auction is a 1977 Porsche 930 Turbo (Lot #1367). This car is finished in Porsche’s iconic heritage Ice Green Metallic. It also features highly desirable sports seats in black leather and full tartan fabric interior inserts in Black Watch Green. Limited-slip differential, electric sunroof and rear wiper give the car all possible options available for the model. A Porsche Certificate of Authenticity confirms that the car is a matching-numbers 3.0-liter 930 with the original engine and transmission. The Porsche comes with original owner’s manual, warranty book and tools. Barrett-Jackson will also auction a 42,000-original-mile 1965 Porsche 356SC Cabriolet (Lot #1385) in Scottsdale. This Reutter Cabriolet left the factory as a stripped-down road-going machine with only a handful of options. It underwent a comprehensive restoration, during which desirable options such as chrome wheels, Blaupunkt three-band radio, C steering wheel with wood trim and Carrera deluxe horn ring, and dash-mounted factory exterior temperature gauge were added. The interior was also changed to its present green leather fitment. The car features a 1.6-liter engine and 4-speed manual transmission. It comes with the owner’s manual, tool roll, full-size chrome spare wheel and a Porsche Certificate of Authenticity. 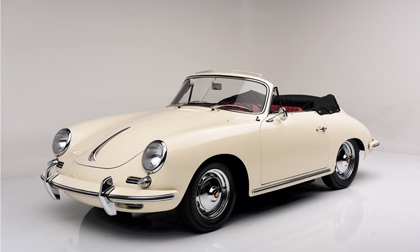 Among other time-honored Porsche collectibles is a 1962 Porsche 356Super 90 Cabriolet (Lot #1386). It is an excellent nut-and-bolt restoration on a rust-free California car. The Reutter-bodied Porsche 356B Super 90 Cabriolet looks like new in ivory paint with black top and red leather interior. Accompanied by a Porsche Certificate of Authenticity, ithas nice fit and finish, with a highly detailed engine compartment. Established in 1971 and headquartered in Scottsdale, Arizona, Barrett-Jackson, The World’s Greatest Collector Car Auctions®, is the leader in collector car auctions and automotive lifestyle events. The company produces auctions in Scottsdale, Arizona; Palm Beach, Florida; at Mohegan Sun in Connecticut, and Las Vegas, Nevada. With broadcast partners, Velocity and Discovery Channel, Barrett-Jackson will feature live television coverage in 2016, including broadcasts in over 100 countries internationally.Barrett-Jackson also endorses a one-of-a-kind collector car insurance for collector vehicles and other valued belongings. For more information about Barrett-Jackson, visit http://www.barrett-jackson.com, or call (480) 421-6694.